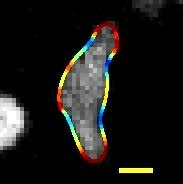 A migrating wild-type Dictyostelium discoideum cell whose boundary is colored by curvature. Scale bar: 5 µm. Augustin-Louis Cauchy defined the center of curvature of a curve C as the intersection point of two infinitely close normals to the curve, the radius of curvature as the distance from the point to C, and the curvature itself as the inverse of the radius of curvature. Let C be a plane curve (the precise technical assumptions are given below). The curvature of C at a point is a measure of how sensitive its tangent line is to moving the point to other nearby points. There are many equivalent ways that this idea can be made precise. Other local expressions for calculating the curvature in arbitrary coordinate systems are given below. For broader coverage of this topic, see Differential geometry of surfaces. 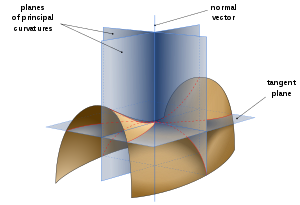 An encapsulation of surface curvature can be found in the shape operator, S, which is a self-adjoint linear operator from the tangent plane to itself (specifically, the differential of the Gauss map). 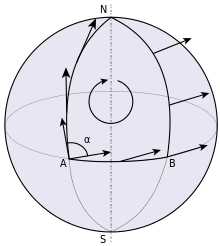 The principal curvatures are the eigenvalues of the shape operator, the principal curvature directions are its eigenvectors, the Gauss curvature is its determinant, and the mean curvature is half its trace. ^ Kline, Morris. Calculus: An Intuitive and Physical Approach (2nd ed.). p. 458. ^ Pressley, Andrew. Elementary Differential Geometry (1st ed.). p. 29. ^ Pogorelov, A. V. Differential Geometry (1st ed.). p. 49. ^ Kennedy, John (2011). "The Arc Length Parametrization of a Curve". ^ Goldman, R. (2005). "Curvature formulas for implicit curves and surfaces". Computer Aided Geometric Design. 22 (7): 632–658. CiteSeerX 10.1.1.413.3008. doi:10.1016/j.cagd.2005.06.005. ^ Kobayashi, S.; Nomizu, K. Foundations of Differential Geometry. Wiley Interscience. vol. 1 ch. 2–3. ^ Henderson; Taimina. Experiencing Geometry (3rd ed.). pp. 98–99.